Tina's Crop Shop: SIP Challenge #67 - Sketch Challenge! Hello! Hope you are having a wonderful week! I had a wonderful weekend but as usual, it didn't last long enough! 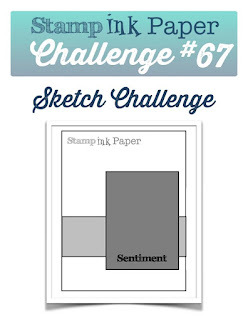 Since it's Tuesday, I'm back over at the Stamp, Ink, Paper Challenge Blog today with my take on a fun sketch challenge! I LOVE sketches! I decided to use the Weather Together Bundle again this week! Here's my card! Wasn't this a great sketch! I loved it! I used a Night of Navy Cardbase that measured 11" x 4 1/4" (scored at 5 1/2"). Next I layered on a Soft Sky 4" x 5 1/4" cardstock that embossed with a fabulous Taylored Expressions Embossing Folder called Raindrops! I adore this embossing folder. It was one of those "must have" moments when I saw it and this is the first time I've used it! I knew I would though although I've probably had it a year or more. LOL My horizontal layer of Night of Navy had a piece of Soft Sky DSP from the Subtles DSP Paper stack. I then ran a piece of Navy Seam Binding around that piece and tied a bow on the left side of it before adhering it with Fast Fuse to the Rain Drop layer! My vertical layers were Night of Navy with Whisper White. I stamped the sentiment from Weather Together in Dapper Denim on the bottom of the Whisper White. My umbrella handle was stamped with Memento Tuxedo Black onto Smoky Slate and cut out with the coordinating die. The umbrella top was cut from a piece of Blooms and Bliss DSP. I added a super thin piece of blue ribbon that I had in my stash around the handle of the umbrella to finish it off.